It was high noon. The heat of the summers could be felt in every cell of me body. Even the sea breeze was menacingly hot. We had been traveling for many days without a shore in sight. These were far off seas we had never been to. Tis be the frontier life. However, traveling in the frontier often reveals rewards unheard and lands never seen. This was much farther and much different than any place we had ever been too. However, me lads we overjoyed at seeing land finally. We had arrived at a far off land full of restaurants. However, we wanted our travel to be worth it. We needed a winner. And that's how we discovered Chili's in Vashi. Feels very western with this modified picture. Do you feel lucky punk? Well do Ya? Traveling far and wide from Mumbai to Vashi can be a daunting task. And the humid Summers don't make the journey any easier. Having a great experience in Chili's Powai was reason enough for me to travel all the way to Vashi for the Chili's experience there. It was a two hour long journey and and at the end of the day, it was totally worth it. I was in my most skeptical mood when I arrived and the restaurant easily impressed me with its themes and grub. 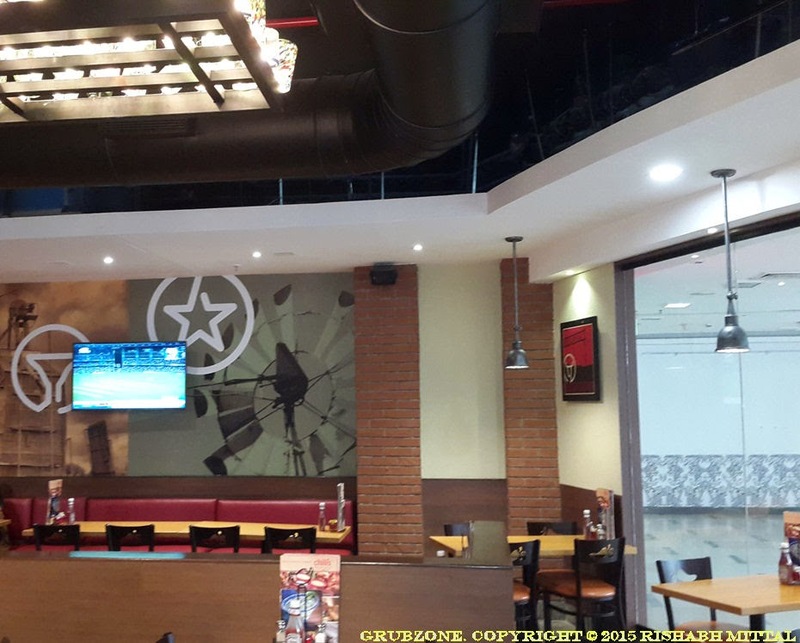 Chili's Vashi has a mix of energetic and rustic Texan diner themes. I chose my table at a spot which felt very Texan. 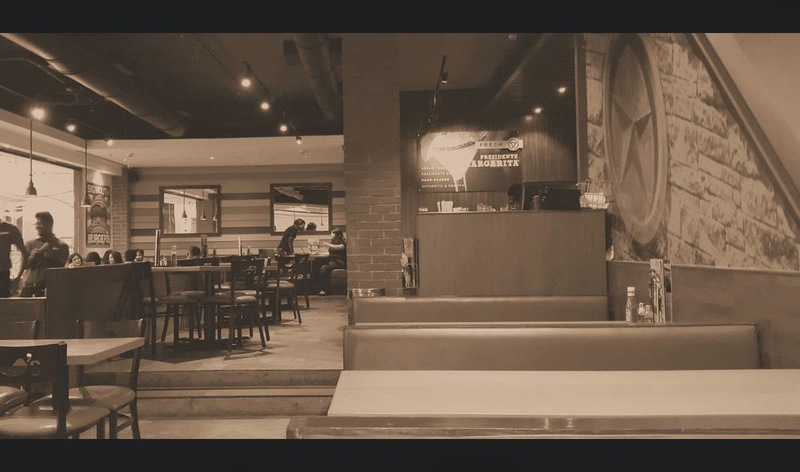 Chili's Vashi is remarkably different when compared to the Powai outlet. The food court in the mall can get chaotic especially on the weekend and on such times its cool to find refuge in Chili's. Two seaters, Four seaters, Six seaters and communal tables. The establishment has several kinds of tables and can accommodate any group up for grub. This outlet has recently opened shop and welcomes patrons with several additions to its standard menu. Since I was a stranger in a strange land, I tried to go sober this time. I decided to hydrate myself with a Fruit Cooler Mocktail and thus came the deliciously red Evolution. This is flavored with Passion fruit and pineapple. Its sweet, tangy and extremely effective against thirst. It restored all my lost energy just like a health portion in a video game. 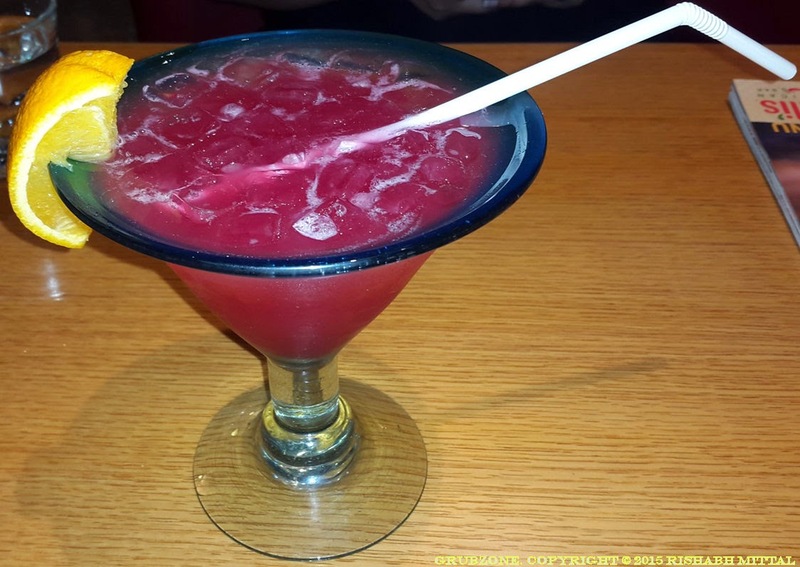 Do note that Chili's does have a large range of wines and drinks for those in the mood for celebrating or partying. Chili's has one of the largest menus that I have seen. Pastas, Burgers, Nachos, Seafood, Quesadillas, Rice etc. (I could go on for an entire paragraph). Its easy to get lost and in such times do ask the server for help. The service at Chili's is decent. The servers can sometimes appear clueless but they are still professional. They also have this peculiar tradition of going on their knees while taking your order. It can be both pleasing and embarrassing(Dude that's the propose pose) at the times but this seems to be their standard practice all across the world. To the vegetarian folks out there, a large portion of Chili's grub is veggie so you won't feel left out. With my grub choices sorted out, it was time to eat. 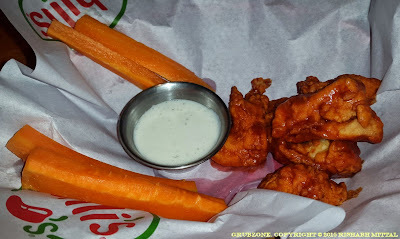 Boneless Chicken Wings - I really loved this item when I went to Chili's, Powai. So it was only natural for me to order this again over here. Start the meal on a good familiar note as they say. The Chicken Wings go well with the ranch dip provided. The restaurant also wraps these in Honey Chipotle sauce or BBQ Sauce upon request. While these were quite juicy and tasty, I did feel that the salt levels were a bit more than normal. It didn't affect the overall taste or cause an annoyance though. The Ranch dip counters the salt in the chicken pretty well. Chili's is bringing the real Chicken Wings back. Time to forget the conveyer belt abomination that one eats at food court joints. Captain : Lad, lets have a fair deal. I'll have the chicken and you can have the carrots. Fifty-Fifty. Crewmate : That does not sound fair to me, Captain. Captain : Well it is fair. For me anyway. Bolder Nachos looked unlike anything I have ever seen before. True to their name they look like big rough fellas who can thrash up regular nachos. The Cheddar cheese coating the nachos provides em the trademark colors. The plating was very beautiful with the cilantro sauce patterns. Although in terms of taste, the sauce felt a bit dull and like an insignificant background actor in the whole act. A generous amount of Sour Cream was provided which paired well with the Nachos. I loved this item, as I was quite bored of regular Nachos and really wanted to try something new. Captain : These Boulders would roll over Regular Nachos. Crewmate : Its Bolder, not Boulder. Captain : But the latter sounds more fun. Crewmate : But its incorrect. Captain : You are doing a week long duty of deck sweeping, grammar maniac. Jalapeno Chicken Quesadillas was the item recommended to me when I asked for a good Quesadilla. Quesadillas are my favorite Mexican item and I wanted to see Chili's take on it. Do note that they serve eight pieces per plate, I however asked them to customize it to four in order to save space for more grub. Each piece contained a generous portion of Fajita marinated chicken in quality butter toasted tortillas. Its flavor was further enhanced with Jalapenos and Monterey Jack Cheese. The sour cream and the pico de gallo(Mexican Salad for laymen) are good pairing options but I think I found the pairing with the chipotle ranch dip to be the best. The dip was so addicting that once I had a bite of the Quesadilla with it, I just couldn't stop. Turning towards a little diversity, I chose Chipotle Salmon as a main. After all, having only Tacos, Nachos and Quesadilla would have been food stereotyping. This is a classical Tex Mex fusion. Fish is not something that one often finds in Mexican installations in India. This dish not only appeared appetizing, it was rather sumptuous. The Chipotle is strong on this one. The rice is Chipotle flavored and the creamy sauce provided with the salmon is a smoky Chipotle sauce mixed with cream. Since, the sauce with the salmon is not purely Chipotle, one can sometimes feel the fattiness of the cream. It feels a bit like egg yolk. The roasted Jalapeno Corn salad appears like a strange and vibrant mixture. But a morsel of the salmon coated with the sauce and some rice along with the salad makes a perfect bite. Mango Chile chicken has a rather confusing name. It refers to the country but the taste positively suggests Chili rubbed chicken breasts. A new addition to their menu under the category of Lighter options, this is one of Chili's relatively less calorie foods. Do note that I said relatively. However, when I go dining outside, I leave my calorie meter at home. This was definitely the best item of this Chili's experience. It had everything I want in a good dish. It had a balance of meat, greens and carbs. It was plated beautifully. There was so much happening with this dish. 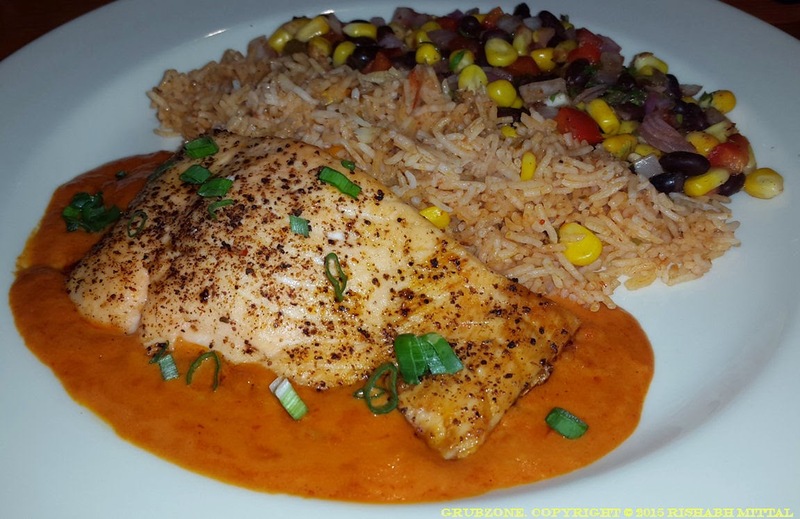 The Chicken breast is marinated with a six pepper blend and coated with a Habanero-Mango mixture. Then topped with diced fresh Avocado. Served with greens and Chipotle rice, this dish has many flavors. The bite begins with a sweet tangy flavor which evolves into spicy-salty as one chews down the morsel. This dish has the potential to be a future crowd favorite. Captain : Mango and Chicken sound so strange together. Crewmate : Well the sea does hold many mysteries. Captain : Indeed, but sometimes strangeness is fun as is this chicken. Crewmate : But where has the Chicken gone...hey! 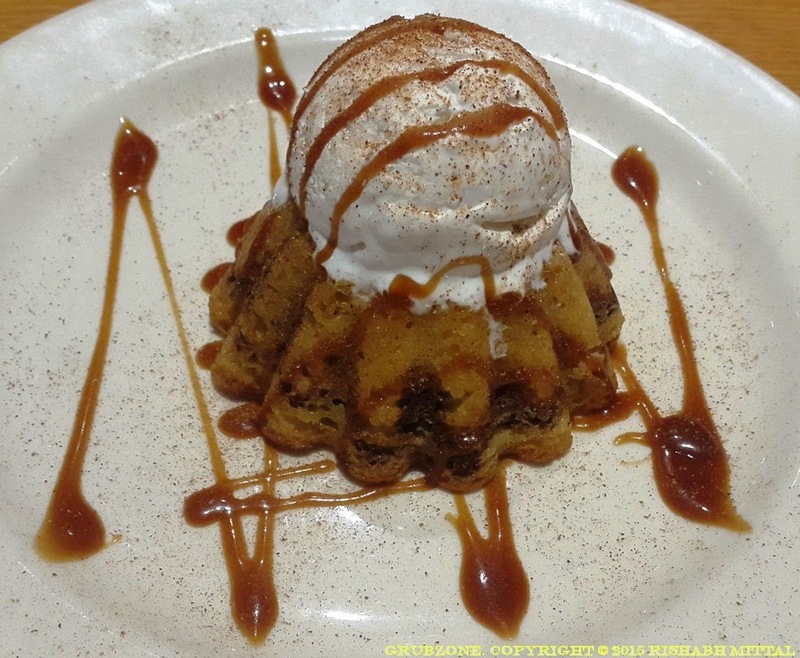 Cinnamon Molten Cake is like the distant fancy cousin of Molten Lava cake. 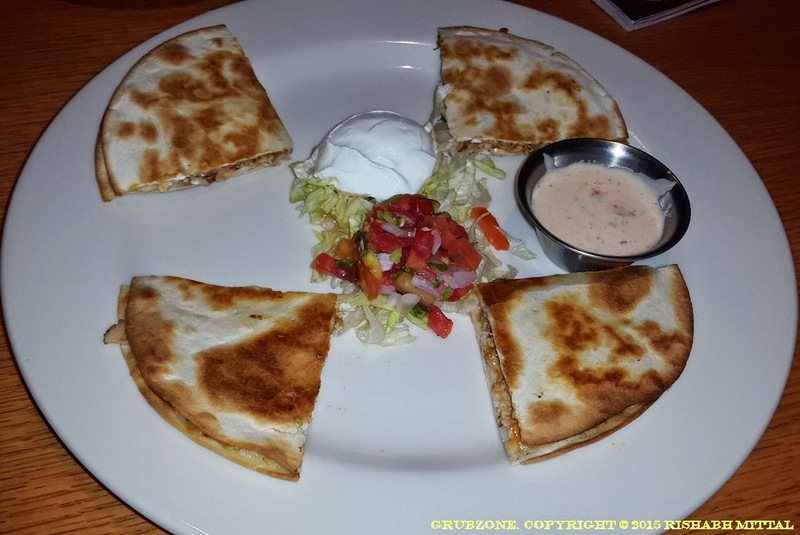 It's a new addition to Chili's menu (At the time of this post) and it aims to please. This is quite a treat for the cinnamon lover. A light colored cake filled with Cinnamon cream forms the mountain below. Regular snow is boring but Vanilla Ice cream as snow is awesome. And then its sprayed with cinnamon sugar and wrapped with a ribbon of caramel sauce. This dish was lovingly plated and it tasted as much flavorful. Chunks of cake with cream, a spoonful of Ice cream, a bit of caramel and lots of love may not make the Powerpuff girls but it surely makes an awesome dessert. Captain : The cake is like gold, the ice cream jewels. Crewmate : Here it comes. Captain : Wrapped in Caramel Elixir, this is truly a treasure. Crewmate : High and Poetic. Chili's pricing is par with what is expected of quality casual dining places. One might feel that its on the higher side but in an age where Casual Dining restaurants are trending across the nation, its pricing feels quite affordable. That plus the American sized large portions make Chili's well worth the money. Do note that Tex-Mex is not the same as Mexican. If you live in Vashi or nearby, a trip to Chili's makes a great Tex-Mex experience. Good Food, Decent service and reasonably priced large portions - That pretty much describes Chili's. "The Super sized fun is over lads, now back on the seas for a Super sized adventure. "